The Strike, pictured with a mid-range battery. We have been waiting for this! Teased since January, Lightning Motorcycles is releasing the all-new Strike for sale. It’s a long-range and low-price electric bike that will be in North American showrooms this summer. This week Lightning unveiled some of the Strike’s most fascinating features ahead of its launch. Gildshire is excited about some of what is coming but wants there to be more, more, more, at the entry-level price point. Here are some examples of what we will get, alongside our thoughts about what we want. Ride Apart helped with the research. There are three batteries, depending on the model you choose, and the options you select for your new bike. The entry-level “Strike/Standard” comes with a 10kWh battery, and an estimated charge range of about 70 miles/highway and 100 miles/city. Unfortunately, (for those who were dreaming of a long-range electric bike for a low price) the Strike/Standard is the model that Lightning about which Lightning advertisements speak. This isn’t a big surprise, as carmakers advertise entry-level models all the time. But we hoped for more miles. Lightning is changing the world of road bikes, one electric charge at a time. What if I need more than that number of miles? The “Strike/Mid-Range” is moved along by a 15 kWh battery. It’s good for 105/highway and 150/city and is priced at 17k. Finally, Lightning offers the “ Carbon Edition.” Its 20 kWh battery allows up to the much-ballyhooed 200 miles/city and 250 miles/highway. The Carbon Edition will set you back $20,000 plus tax. While it isn’t the bargain price we hoped to see, it’s still much more affordable than most electric motorcycles on the market. The batteries are paired with an AC induction motor that is air-cooled, while the two smaller models are rated at 90 horses and180 lb-ft of torque. The $2,000 option achieves 120 horses and a similar torque number. The two less-expensive models have a 3.3 kW charger as standard equipment. You can upgrade to 6.6 kW of charging power for an additional $1,500. Level Three fast charging capability is yet another $1,500. The Carbon Edition comes equipped with the top-of-the-line charging system standard. What do those specs mean in real life? Level 1 – Overnight: Works with any 110-volt household outlet. Wake to a full charge. Level 2 – 2-3 hours: Access a network of 50,000+ public charging stations across the United States. DC fast charge: 100+ miles in just 20 minutes. The Strike borrows several of its styling cues from the Lightning LS-218. That said the Strike is far less extreme in its curves and angles. It’s better adapted for everyday use and looks the part. 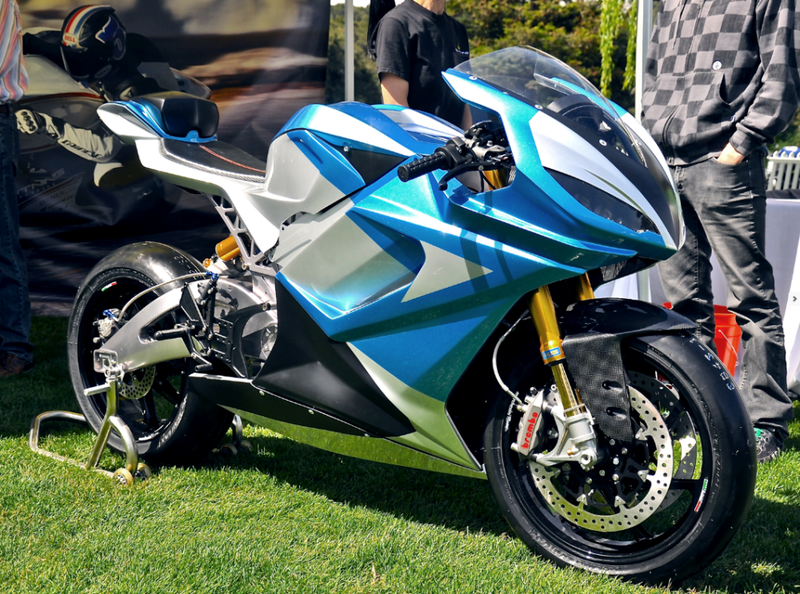 According to the company, extensive wind tunnel work allowed them to build the most aerodynamically efficient electric bike the world has ever seen. When can I get a Strike? Lightning intends to start the ball rolling this summer in the domestic and Canadian markets. Expect a word to the wise in July. They will start with the Carbon Edition and work down from there. The international rollout is planned for around the New Year, but exact dates are still in the planning process. Gildshire will monitor the situation for rollout delays or other announcements.